I read this product three times. I will be honest, the first time I did not like what I was reading. The second time I tried reading with an open mind toward the API line of products – I still wasn’t too fond of Spectrals. The third time was much better and I found myself beginning to understand the world the designers were intending to present. I am very glad I allowed myself the extra time for the third reading, but very few gamers will take the time for three ‘go-throughs’ in my experience. I would like to begin with a little commentary on the cover art. The cover is a little indistinct and does not invite the reader to delve very deep. Unfortunately, this was my first impression of the product. I do like the burning cemetery visual across the top, but the cover art is too simplistic in form and function and the interplay of color is off-putting. True, the depiction covers the creations the product tries to enliven – but it just does not do them justice; however the cover work chosen by 3EG is improving. This artist also had some very moving black and white pieces in the interior that were very well done. The cover piece felt almost like it was not finished. The black and white interior artwork is creative and exceptional in presenting the ephemeral ideas the designers described. It is a very difficult task to create form around an idea or a passion yet these bright artists have done so. I look forward to seeing more than interior work from them in the future. One critique of the interior layout is the splattered background; this was not easy to compensate for with my old eyes. I had to focus around the darkened splattered background for some of the paragraphs. I believe this was one of the initial dislikes and part of the reason I knew I had to reread the product at least twice more. I would suggest somewhat lightening the splattered watermarks to ease readability. Editing in the product gets an A-. It gets better outside of the commentary and story bars. The actual nitty-gritty nuts and bolts has all the proper ‘p’s and q’s’ in the right places. It is the journalistic entries and the “storified” sections that suffer from the lack of the red pen. It is difficult to edit thoughts, feelings and dialogue without rewriting whole pieces and thereby stifling intention. I believe the judicious use of a ‘pink pen’ may have helped the flavour in a few of the longer pieces. Editors still need to give love, but it doesn’t always have to be tough. Content, content, content – all I can say is WOW. There is so much information packed into this product I was overwhelmed on my first read. I focused too much on amount of information that I missed quality of information on my first time through. The second time I was better prepared and the third time I actually had time to enjoy the product and some of the dark whimsy added in for flair. I felt like chapter one and two were just a continuation of each other. The chapter break was more a break out of necessity rather than a break for content switch. This product took a little too long describing what Spectrals were and overdeveloped the examples. At some points I felt like I was being spoon-fed too much information and my head was spinning – sometimes less really is more. At other times the designers really nailed the perfect amount of information and description with examples. The discussions of the CEO of API or child ghosts were very well done. These two chapters comprise the bulk of the first thirty-four pages following the Prologue. The third chapter (the next fourteen pages) covers societies and was interesting, bleak and sad – then interesting again. The coverage of each group and society was well-paced, provided the right balance of information and examples. This was perfectly timed writing and I thoroughly enjoyed this chapter. 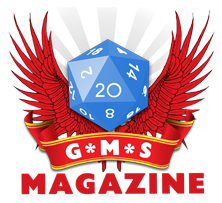 The fourth chapter gets into some of the game values for items and powers used on or by spectrals and for some of the special types of spectrals, demons or humans. Again there is a tendency to over-explain, but the game value is immense. The items are unique and well-presented and are quality work. The fifth section of the product is a short adventure and this is a true gem buried in the back. The adventure is well presented and is not the type to force action on the gamers. This is a situational encounter type of adventure drawing the players in by presenting choices and intrigue rather than telling the players what they have to do. It is also a very good introduction to what spectrals are and how they operate. It is a very nice end to the product and shines through the difficulties in the rest of the product. What follows the adventure is an index – yes, and it is a very good index and much appreciated. And following the index are ads for other 3EG products and other games. Overall I give the product three and a half out of five stars. This is an average product with both good and bad moments. The adventure is definitely a diamond in the rough and the interior artwork is amazing. The amount of information being forced on the reader is a negative in this situation as the way it is presented is similar to a psychology lecture at a University – interesting moments of brilliance buried in a lot of talk. I tend to hold off on reading other people’s reviews until I have reviewed the product myself…I’m fairly amazed at how much different my impressions were (I thought the product was a must-buy, I was less than thrilled with the adventure, and I loved all of the information on how Spectrals…well…exist, really). Don’t get me wrong, I’m not criticizing, merely responding…I full understand that different people can read the same thing and have completely different ideas of the product…do you have any prior experience with API, perchance? Thank-you for responding! Yes, I am familiar with API products, I really do enjoy them as they are a creative breakaway from the typical pen and paper RPG. This is the best thing about the gaming world so many choices and they can be viewed so many different ways by so many people. I also do not mind criticizing. Fire away as I believe in differences we get the best interaction and discussions. 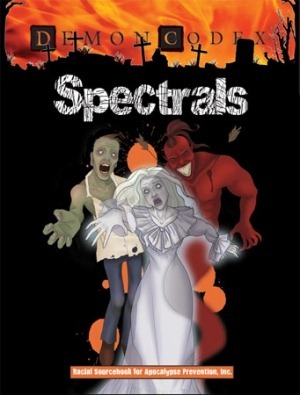 I believe Spectrals is a good solid product. I just thought it did a bit too much explaining and it took me awhile to read through and digest. I am a story-driven DM in my personal games and the appealed to me as this type of DM. Believe me, I know most people would prefer a bit more directed action and that is okay too. I enjoyed the different writing styles that appearred in the product and I can tell the designers believe in their work and love what they do. This is a big plus in how I read a product and it helps determine my use of the product and initially if I will purchase it.